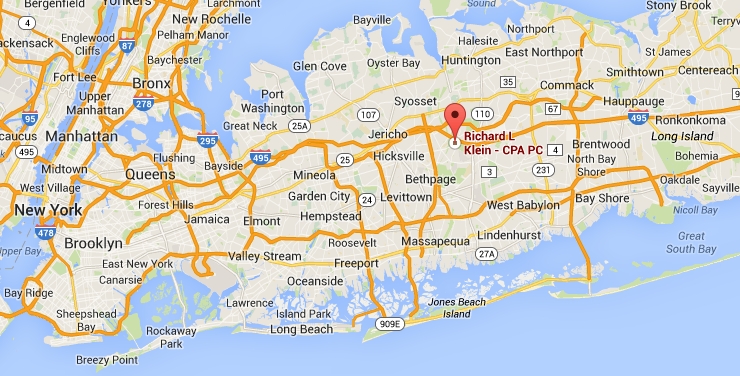 Richard Klein – CPA PC is a CPA in Long Island, NY. We provide customized and comprehensive accounting and tax services for businesses and individuals alike. We know first-hand the importance of a trustworthy and reliable professional relationship and understand that there are countless options when it comes to choosing the right Long Island CPA for you and/or your business. To minimize any uncertainty, we gladly offer a free initial consultation so that you may get to know us better and feel 100% confident in the services we offer. Call us now at 516-855-1015 or complete our Prospective Client Form. 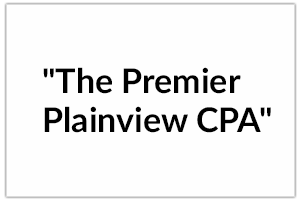 I have been operating my Plainview CPA Firm for 36 years running and I would like to express my gratitude and appreciation to my clientele as well as the surrounding community. I take pride in providing the absolute best service and client experience possible for everyone that I work with. Being centrally located in Plainview has been wholly beneficial to the success of my company and has allowed me to develop an amazing client-base based on referrals. The success of my company is dependent on the quality of the services I provide as well as how it is received by the client. I ensure that there is no reason to switch or choose any other CPA firm on Long Island because I am confident that the work I do is superior to others in the industry. Since 1978, Richard Klein has been committed to providing clients with close, personal attention and service. He takes great pride in giving clients the assurance that the services they receive are the result of many years of both professional training and real world experience. The ongoing investment of time and resources in professional education and state of the art technology as well as the cultivation of strategic business relationships and alliances, is consistent with our commitment to excellence. Richard is extremely proud of the fact that a large number of clients have been with the firm for many years, and that the firm continues to grow largely as a result of client referrals. We are able to scale our client-base while never forgetting that the personal attention paid to each client’s situation is the foundation of the firm’s success. 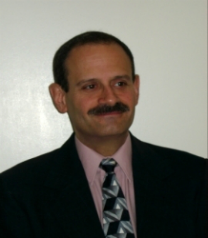 Richard L. Klein, CPA, owner, has been practicing in Plainview, Long Island and the greater New York area for 36 years. He is licensed to practice in the State of New York and is a member of The American Institute of Certified Public Accountants and the New York State Society of Certified Public Accountants. Richard graduated Queens College of CUNY in 1978 with a BA in Accounting and attended graduate school at Bernard M. Baruch College. He is also a member of the Plainview-Old Bethpage Chamber of Commerce. Richard’s career has been diversified, from public accounting to internal audit. As a Certified Professional Accountant in Long Island, NY, it is my obligation to uphold the highest standards of ethics and trustworthiness. Without these two, my business would fail and my clients would be deeply hurt financially. With professionalism, comes great responsibility and as a CPA serving clients all throughout New York State, it’s not only my duty to provide the best possible accounting services, but also my obligation. 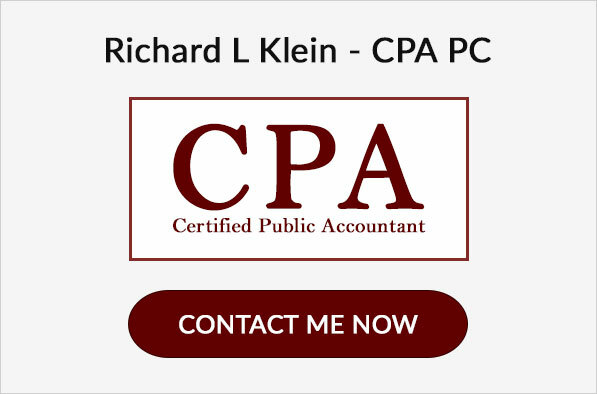 When I became a CPA and opened my Long Island CPA firm; Richard Klein CPA-PC in Plainview, I made a commitment to my clients and any other individuals or businesses that I would serve in the future, to abide by the most current tax and business laws and to ensure that each client’s current situation is perfected. This means that their business’s finances are in an optimal state and taxes are augmented to ensure proper deductions, fees, and other laws are accounted for. 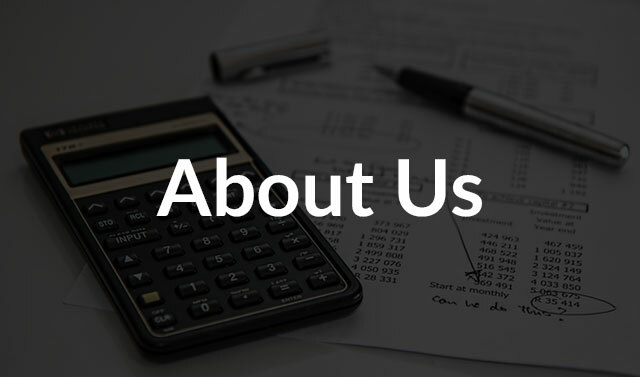 My team and I pride ourselves on the trustworthiness and reliability of Richard L. Klein – CPA PC because we believe in top-notch accounting services and will not settle for anything less. Our goal is to create a 100% client satisfaction rate, because anything less is simply not acceptable. The CPA services we provide are nothing less than stellar and in order to maintain this quality of work, we are constantly working with and in communication with each and every client. Whenever you have a question, or simply need guidance, we are here for you. We are not an accounting firm that looks to provide the quick service for a fast return. We build long-term professional relationships with our clients so that we develop only win-win situations. Long Island is a hotbed for CPA firms, and I don’t want to sound egotistical when I state that we are a top-tier firm on the island, but it is simply the truth. You can trust in me and my firm without hesitation because we use our 37 years of professional experience to put all of our knowledge and efforts into your financial situation, whether it is personal or business related. Contact Richard Klein – CPA PC now to be absolutely certain that your finances are being handled with professionalism and care. Copyright © 2018, Richard L Klein CPA PC. All Rights Reserved.